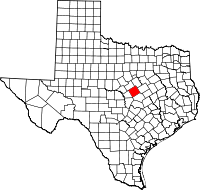 Coryell County, located in central Texas,is surrounded by Hamilton County, Bosque County , McLennan County, Bell County , and Lampasas County. Gatesville, the county seat, is on Highway 84 and Highway 36, about eighty miles north of Austin and 110 miles southwest of Dallas. Coryell County. The area that became Coryell County was part of the Milam Land District, assigned by the Mexican government for settlement first to Robert Leftwich in 1825, and later to Sterling C. Robertson. Some of the land was surveyed as early as 1835, but few settlements existed before the late 1840s, when the United States established Fort Gates and other military posts along the frontier to protect incoming residents from Indians. The line of frontier forts was moved farther west in the early 1850s, and Fort Gates was abandoned in 1852. Settlers in the Fort Gates area numbered about 250 at that time, and they began to campaign for a county seat. In 1854 the legislature established Coryell County and named it in honor of frontiersman James Coryell, an early landholder. 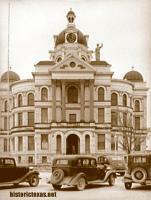 Residents chose the site for Gatesville, the county seat, in an election held in May 1854.